Here is a list of all the postings Bob Cotsford has made in our forums. Click on a thread name to jump to the thread. I try to replace screw retention on hatches with a spring latch, either a single central latch or one each side mounted in the fuselage side mounted so that the sprung pin locates into a notch in the edge of the hatch tab. As I'm all electric now I want quick access to the battery so screwed on hatches are out. Thread: Anyone for a Tiffie? I think the red bomb racks on the wing underside tie it down, it's BEB's. Warrington is only a couple of hours up the M6 so as a life member of the RB396 restoration group I feel obliged to put in a bid. 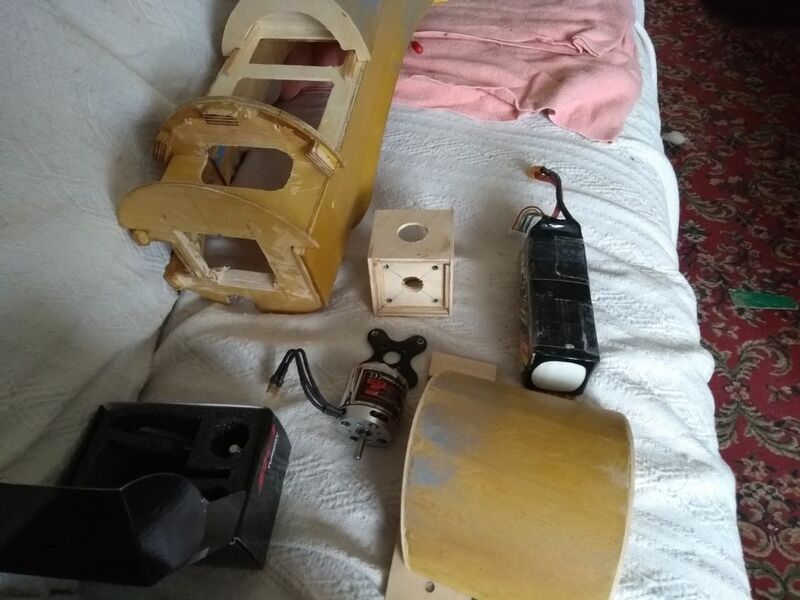 Mine had a hatch in the underside of the nose between the front formers, it also had another hatch under the tail so I guess that a previous owner hads found it needed tail weight when running a petrol motor in it. I used an OS 120 Surpass and it went quite nicely, not overpowered by any means. The tailplane was sheeted too iirc. I still have a pair of wings and a tailplane from mine, maybe even the fuselage somewhere. It's possible that the floats are up in the loft too. Mine was PAW19 powered, but I always thought it would have flown better with less washout and more power. I don't recall seeing the plan the last time I went through the pile unfortunately. My WotsWot (uses the same battery mounting system) will happily accommodate a 6S4500 pack. OK, happily might be stretching things but it fits. Just use a slightly lower kv than the recommended motor, or a smaller prop for 6s. IIRC my WW has a 4258 size motor rated at 500kv with a 13" prop - 13*8 rings a bell or it might be 13*6.5 . How oddly appropriate, my home address starts 'pilots.x.x'! Thread: Who Else Wants a 63" Lavochkin La7 kit? One lesson learned on the Taifun is that metal motor standoffs get in the way when you need to move the battery forward. Admittedly the Taifun has got quite a long tail moment compared to it's nose length but having to add 10oz of lead is still a bit of a pain. That's one model that really could have benefitted from a top hatch and wooden box engine mount! Back to the La7 - I can leave final battery positioning until after painting and fitting out. Someone has even thoughtfully provided an air channel in the side of the cowl that's perfectly sized to take an esc . First the scrap-box cutting guide to help getting a straight square cut with a standard razor saw. the ply crutch coss member needed relieving in order to get bigger 6S packs through, servos will go in the cutout at the rear. Big 'ole in the front bulkhead where there used to be a moulded IC engine mount. I aught to tidy it up by cutting out the redundant throttle cable outer. Having got bored with wheezing my way through winter I finished off the Graupner Me Bf108 Taifun and now it's the La7's turn. First I needed to get rid of the oily-based bits and replace them with electricity compatible parts. 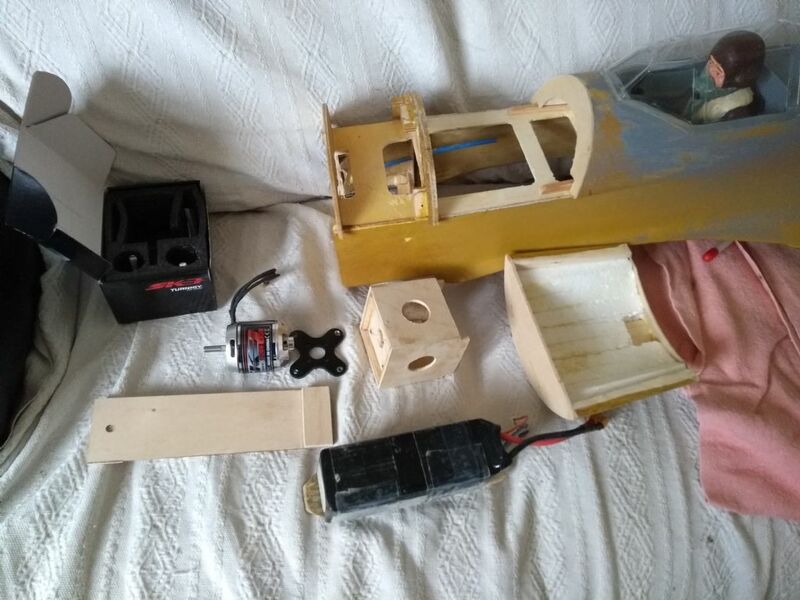 If I'd gone electric from the start I'd probably have made the veneered top a hatch from F2 back to the rear of the cockpit, as it is a top hatch has to end about an inch in front of the canopy. To lift out the rear face needs to be angled, a quick geometry job on the side view gives the rquired angle. 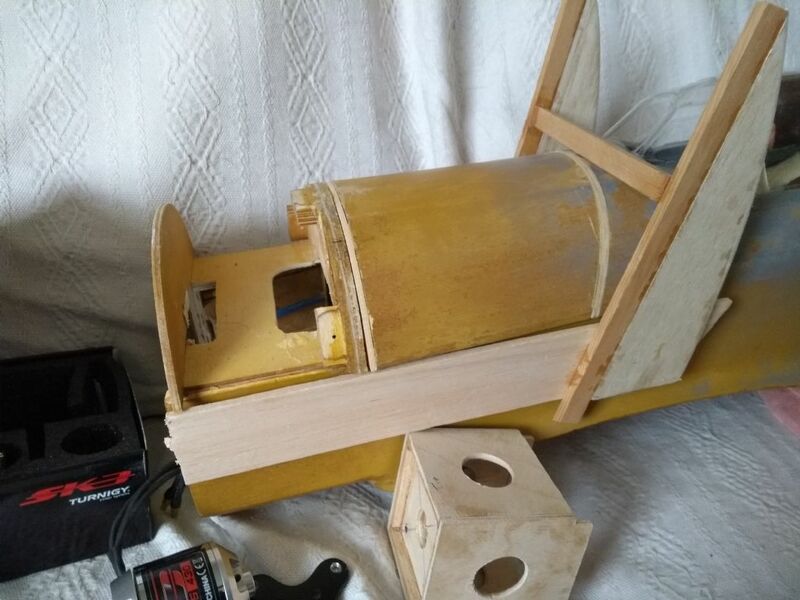 The scrap box provided materials to knock up a guide that clamps to the fuselage sides and, as it's name implies, guides a saw to cut the required angle into the top deck. I took out a slice 9/32" thick to allow for 1/16" ply facings and a coat of paint. Another slice out at the front of the top running down the rear of F2 meant that sliding a blade between the ply crutch and the 1/2" square either side feed off a top hatch. Ply facings, drillings through F2 and the front facing gives locations for two dowels and a balsa platform let into the centre rear will provide a mount for a spring latch. At the front a 1/8" ply box provides a stand-off to suit a 5055 motor and if needed can accept the front of 6S LiPo pack. A Ripmax -Wot style battery mounting plate and I think that's the woodwork complete. Parallel two of the 1850s to give a 6S 3700mAh pack, that gives you a large range of models that will perform well on the available power - WotsWot, Acrowot, Bollero for a start. Crowdfunding page - every little bit helps! Sure? Skip ~ £250, funeral ~ £4000. I tend to have a favourite of the month and then I try to rotate the second and third models that I take so that they all get a regular airing. It doesn't do much for getting really familiar with the flying characteristics but it does keep me on my toes and interested. Favourites usually rotate between various Wots though the ARTF WotsWot and Wot4 dominated last year, closely followed by a Flair SE5a. Much depends on the weather on the day. My problem with Poly-C is that it needs so many coats to fill the weave of even lightweight glasscloths. PolyC/glass gives a more resilient finish than epoxy in that it flexes more, but it does appear to peel off more easily as I found out when examining the remains of my Poly-C/glass covered Joker. I wouldn't call it's adhesion poor, just not as good as epoxy, but if it's bonding to balsa either will be stronger than the wood itself and will pull away the outer wood fibres rather than peel away cleanly. Use it for glass mouldings - I've not tried it but I'd guess you would be painting on dozens of coats to fill the weave on heavier cloths and I suspect shrinkage would be a major problem. Epoxy would be both quicker and stronger in my opinion. Sorry Don but I too believe it to be re-packaged Ronseal industrial wooden flooring sealant/varnish. I also believe it gives off something in addition to water when drying, as a COPD sufferer I can detect airborne chemicals down to parts per million levels! Sam35 looks to be the place for olde-worlde models and freeflight, iirc there is a growing trend towards 'radio assist' which just allows RC control of a small rudder for emergency use just to keep the model within bounds, otherwise the models are trimmed and flown as pure freeflight. We used to use the auto rudder to keep the model circling, as you say, which with luck on a calm day would keep the model somewhere near the launch site give or take 1/2 a mile. If the model gets into a good thermal it can vanish upwards to several thousand feet surprisingly quickly, any wind at all and it could travel miles. Even if it comes down within that half mile it can take binoculars to keep track of it. If you want the model back invest in a dethermaliser, the clue is in the name!